The barrel racing industry is starting to see a new trend; and hopefully it will shift into a new way of thinking: to support horse health throughout his athletic career for long term benefits. If the equine body’s soft tissue is prepared properly for competition; it can prevent injury, and allow for quicker recovery time if injury does present itself. Veterinarians and horse trainers agree that equines used in speed events sustain more injuries than any other discipline besides jumping (English). Maybe you’ve already accepted that your horse may get hurt and hope to have a good run while his soundness lasts. There is a way to sustain your investment without readily accepting early retirement from a diagnosis such as, “loaded stress on the tendons and ligaments resulting in measurable tears and proliferation”. I’ve discovered maintaining soundness is not a spectator sport.. If you suspect your horse is exhibiting lameness from a soft tissue injury, it’s better to be safe than sorry. An accurate diagnosis from a Veterinarian with high quality medical imaging, is the right approach to begin healing. Recent experiences have shown that some soft tissue injuries can heal, and regenerate into healthy tissue again. In my personal experience I was able to facilitate the improvement of an old Superficial Tendon tear and Deep Digital Tendon proliferation in 8 weeks, with 60 minutes of Whole Body Vibration and Low Level Laser Therapy, daily. By 19 weeks, the tendon showed nosigns of: trauma, injury, or scar tissue. The modalities that accelerated my 14 year old gelding’s healing were the EquiVibe Plate (WBV vibration plate at 10-60 Hz) and a cold laser (660nm). 5/12/15. No your vision isn’t cloudy – that is what chronic tendonopathy looks like under ultrasound – a feathery, shapeless form, with unidentifiable loose ends. And the dark/black dots are holes in the tissue, about the size of a pencil eraser. 7/ 20/15 Depicts a cleaner, connected more identifiable image of the tendon, while the adhesion is still present mid tendon, but the proliferation on the edges have closed and connected back to the main body of the tendon. 9/23/15 The tendon shows no evidence of scar tissue, or injury in 14 year old gelding. Traditional healing protocol suggests options like: IRAP (Interleukin-1 Receptor Antagonist Protein), stem cell therapy, surgery, and rest. These require consistent and multiple applications/doses/sessions. This can become expensive quickly. The recovery time for a horse can vary from about 3 months to over a year. And complete recovery is not common or guaranteed with such traditional options. These options are also directly related to healing at the injury site only, with no other benefits to the remaining parts of the horse’s body. When a horse rests for long periods of time, his bones may lose density and become mineral deficient because the muscles are not getting any electrical impulses to use the nutrients his body is consuming. This can pose other risks to the horse’s health, along with great risk of re-injuring himself because the rest of his body has fallen into a state of atrophy. It’s important to remember your horse’s entire body when treating a specific area of injury. In previous articles on my blog IntegratedEquine.net, I share the Whole Body Vibration (WBV) benefits for performance, rehabilitative therapy and preventive care programs. 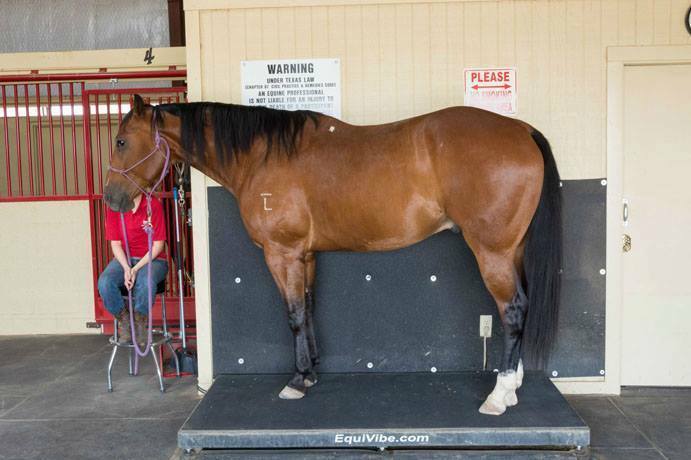 By using the EquiVibe, I found that it benefited the condition of the soft tissue injury and I was able to keep my horse’s body condition at a maintenance level which would allow us to ease back into exercising safely. The 8 week ultrasound re-check prognosis suggests: “Results indicated mild improvement of the DDFT and SDFT tears compared to the last exam. There was still not complete evidence of adhesion formation between the SDFT and the tendon sheath.” This was encouraging to our situation, considering old tissue seemed to be re-attaching itself. I continued to provide rest and same therapy (as above) until further progress was made. At the 19 week mark, the ultrasound re-check prognosis suggested: “Results show his deep digital flexor tendon is healing well. He has progressed faster than most horses with similar injuries. There is minimal residual hypoechogenicity on the axial margin of the tendon, where it was previously torn.” An injury that once suggested it could have been as chronic as several years old, with the probability of having frequent re-injury, showed “clear” on this ultrasound re-check. In less than 4 months since the suggestion of retirement. A clear before (left) and after(right) of the same tendon with 4 months of therapy. Left shows a tendon that wasn’t connected on the outside edges, well as holes in the body of the tendon. Right shows major progress, CONNECTIVITY. Initial 3 weeks of “paddock rest” with ice compression. Hand walking in straight lines for 4 weeks after “paddock rest”. 30 minutes of EquiVibe therapy 40-50 Hz, twice daily. Red Light Therapy to site of tendon injury 20 minutes, twice daily. Science shows that red light therapy and whole body vibration lead to enhanced circulation accelerated healing, and bio-cellular-stimulation. Since Adenosine Tri-phosphate (ATP) is a necessary component of healing, one would find it powerful to know these tools kick start the release of ATP in the bodies system when illness or injury is detected. The sooner you can stimulate the body to do what it would already do to heal itself naturally – the better your horse will respond to the therapy. Another reason well-researched studies suggest the accelerated pace of healing is the way collagen reacts to these therapies. The body is made up of about 30% collagen (glue for the body) tendons are no exception that they are compromised of these thin fibers. When the cells of the fibers are stimulated by the frequency of the light and sense the vibration; it “tricks” the collagen into being produced at the rate it would be if it was healthy versus if it was damaged. Vertical vibration from the platform supports the body’s natural movement and skeletal loading tendencies, and the nanometer range of the light therapy compliments the cellular vibration of a healthy cell. A winning combination – without consequence. It is possible for chronic and acute soft tissue injuries to horses can be taken care of non-invasively, side-effect free, and on a feasible budget. This is the answer competitive horse owners should be looking for. While it is possible that extremely old/severe injuries may never return 100% to what they functioned as before (a 15 year old horse’s tendon won’t time lapse into the functionality of a 2 year old), the dignity and well being of the animal won’t be compromised. And in our experience the animal can return to being a successful competition horse – so long as the whole health of the horse is wisely monitored. The initial investment in a quality therapy product that supports the needs of your goals will pay off in: immediate elevated performance, with long term soundness, and continued earnings. Less invasive therapies (like whole body vibration and red light therapy) are proving just as effective, less risky and less expensive than more traditional options involving drugs and surgery. Case studies, like this one, support the evidence. I believe obtaining education on common injuries and therapies will make barrel horse’s careers more long standing, therefore getting the most out of the horse’s ability while maintaining their dignity. My horse – I purchased this horse from the seller with what were believed to be unnoticed issues, including the severe and chronic tendon tears that went undetected in a pre-purchase exam by a veterinarian. At the time of an additional thorough lameness exam 6 months into my ownership; an Equine Vet Hospital stated that: the ultrasound depicted a chronic (older than 6 months) tendon tear and tendon proliferation. Your horse – I want to be transparently clear, that no matter which route you and your Vet decide is best, there’s no right or wrong way to heal a soft tissue injury. Whatever you have the time, money and skills for is the best option for you. I am not a Vet that is able to treat, diagnose or suggest any types of therapy or say that any of these therapies will heal your horse. I am a professional horse trainer, and certified body worker with hours of field experience and my own case studies to draw data from. All horses – Take caution to adjust your hoof and dental care schedule to your horse’s needs and changing body. Whole Body Vibration and red light therapy in consistent applications will indeed cause accelerated hoof growth and tooth eruption – so attention from the proper practitioners after a select period of time is required. Taking the shoes off during this time may or may not be the route you should take. I’ve mentioned in previously written articles my observations of the effectiveness of thePhotonic Health light therapy products (cold laser) and EquiVibe Platforms. These were both necessary tools in our healing.